Roger Stone, a longtime adviser and confidant of President Donald Trump, pleaded not guilty Tuesday to felony charges in the Russia investigation after a publicity-filled few days spent slamming the probe as politically motivated. The voluble Stone, 66, held no press conference as he arrived and departed the courthouse amid dueling chants of "Lock Him Up" and "We Love Roger." He waved and smiled to the small crowd, some holding up glowing photos of him, and he largely ignored a group of protesters carrying signs reading "Dirty traitor." The Beatles' "Back in the U.S.S.R." blared from speakers outside the courthouse. Although large crowds surrounded him as he was driven away in a black SUV, Stone was more subdued than during the circus-like atmosphere of his Friday court appearance, when he emerged in a blue polo shirt, flashed a Richard Nixon victory sign, predicted his vindication and vowed that he would not "bear false witness against the president, nor will I make up lies to ease the pressure on myself." Stone, who was arrested last week at his Florida home, is the sixth Trump aide charged in special counsel Robert Mueller's investigation. 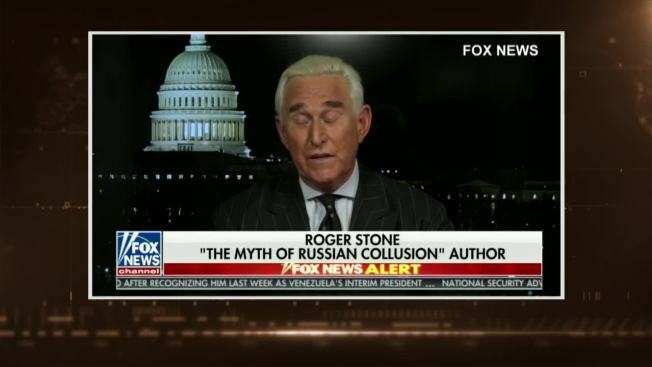 The indictment does not accuse Stone of coordinating with Russia or with WikiLeaks on the release of hacked Democratic emails. But it does allege that he misled lawmakers about his pursuit of those communications and interest in them. The anti-secrecy website published emails in the weeks before the 2016 presidential election that the U.S. says were stolen from Democrats by Russian operatives. He remains free on $250,000 bond.